Successfully Added Media Nova - Portable Multimedia Projector (100 Lumens, VGA, AV) to your Shopping Cart. The Media Nova, a portable multimedia projector with one of the biggest and brightest screens available from a portable projector! What makes the Media Nova so amazing? Well, for starters it produces the brightest picture we have ever seen from a projector of this size, it plays movies, music, photos and more from a SD card or USB memory stick, has a composite video IN connection for connecting to your DVD player-- MP4 player, video game systems and more, and comes with an amazing 100 lumen rating. This makes the Media Nova our brightest mini projector yet! Continue reading to learn more about this incredibly powerful mini projector. The Media Nova is an incredible little machine. Despite its small appearance, this mini projector still manages to produce up to a 150 inch screen in stunningly gorgeous smooth motion video! And since this portable multimedia projector is rated at 100 lumen output, you can even use this device in areas that are not very dark at all and still enjoy great quality images. 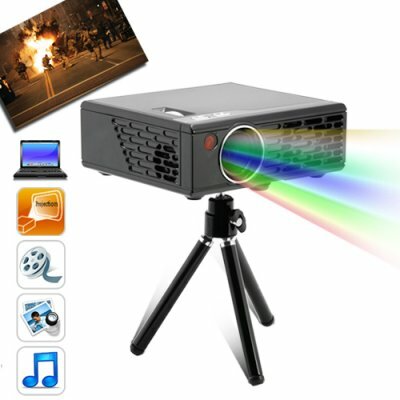 However, when used in darker environments this mini projector produces spectacular quality images that will make you feel as if you’re actually sitting in a real movie theater! And to make things even better, you can also select between 4:3 and 16:9 aspect ratios which allow you so view DVDs or media files in their original size format without loosing any of the picture information like you would on a normal 4:3 projector. This multimedia projector is the ideal replacement for your living room TV because it allows you to achieve the largest screen size possible per dollar without sacrificing image quality. Just imagine if you wanted to purchase a similar quality LCD TV with a 150 inch screen… the price would be unimaginable. Which is why the Media Nova is so amazing. For roughly 1/5 the cost of a 40 inch LCD display you can have an impressive 150 inch screen that’s easy to move from room to room and can connect to just about any media source. This portable projector is also great for presentation use as well. Simply connect the VGA cable from the projector to your PC and you can enjoy the luxury of a big screen display in not only your home, but your office and meeting room as well! When first looking at the Media Nova you will immediately notice the attractive glossy black finish and simple yet elegant design. That’s because the Media Nova was designed to appeal to both professionals on the go as well as homeowners who want a simple yet attractive design that complements their home décor. If you’re looking to buy the most powerful mini projector that is easy to carry and has an array of input options, then the Media Nova is for you. Order one today and don’t forget to come back and leave your positive reviews when you are completely blown away by the power of this mini multimedia projector. The Media Nova is in stock now and ready for immediate shipment. Available only from the leader in factory direct wholesale electronics, Chinavasion! Yes, the Media Nova is perfect for watching movies, even if lighting conditions are less than ideal. Is there a built in battery? Nope, this projector is much to powerful to run on batteries.